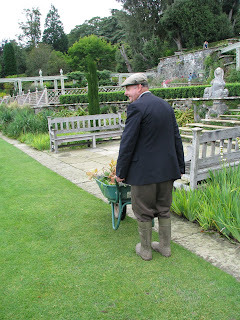 Who knew gardener's still wore early 20th century clothing to go about their daily gardening duties? 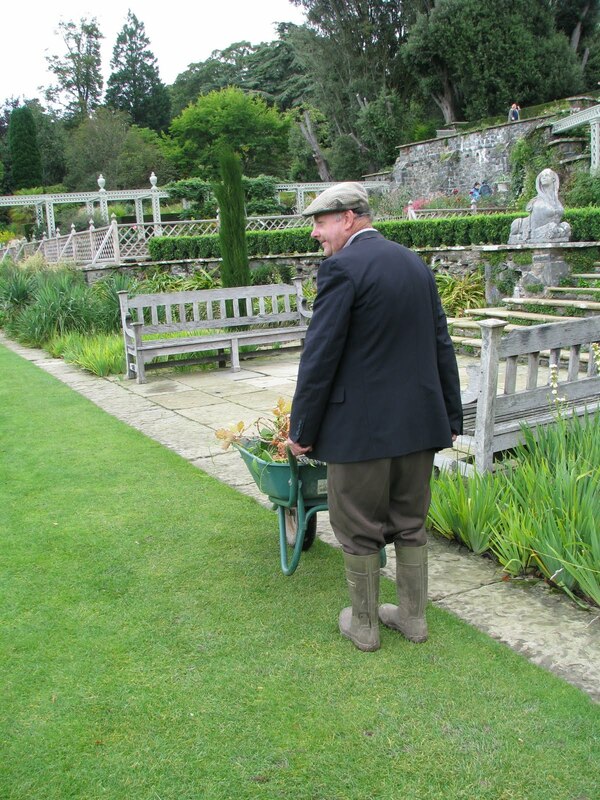 Complete with cap, suit jacket, short pants and boots, this unknown gardener has it all. Apparently it is rare - or at least this is the only period gardener I glimpsed. 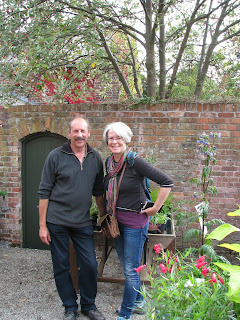 He was in the beautiful and famous Bodnant Gardens. I did originally take a photo of him from the front but when I pointed out to him his zipper was undone he shuffled off without answer so I took this more demure photo from behind. 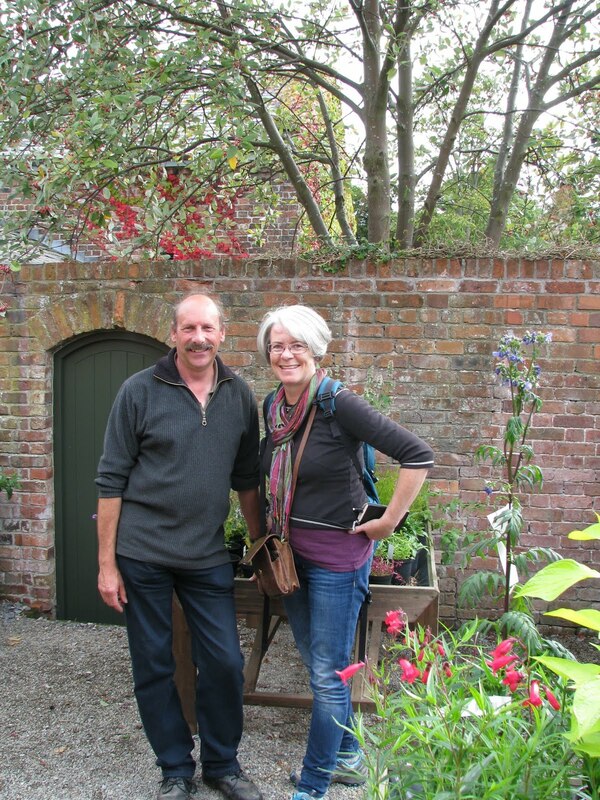 Gardener Glyn Smith and jet-lagged Donna Balzer (AKA me) pose in Glyn's incredibly diverse garden - Erdding Hall in Wrexham, Wales. Yes it is early in the morning - or maybe late at night I am not sure but it was day one - the only time I thought to pose for a picture in Wales just to prove I really was there. The bus waited while I ran back to get my purse containing passport & money. Oops! That wasn't the only time I left my purse behind but I did stop blaming it on jet-lag. 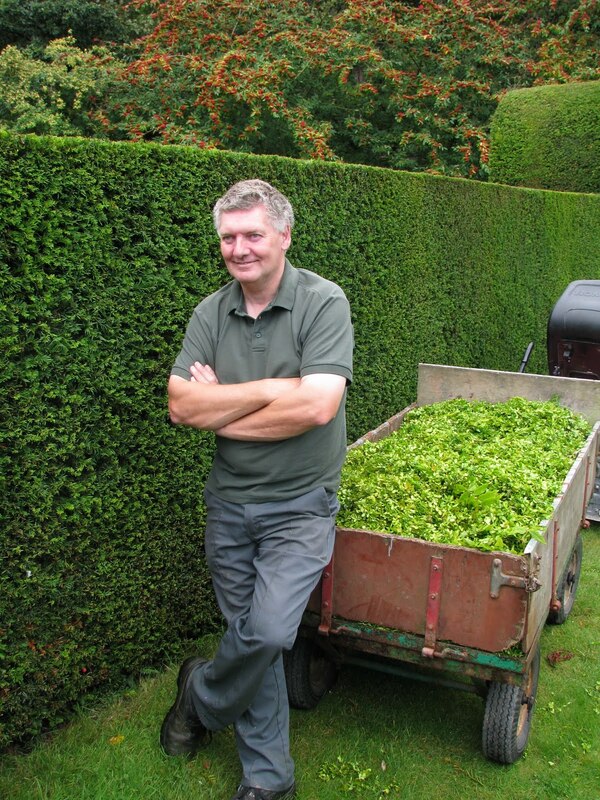 Head Gardener, Robert Owen, kept the Bodygallen Hall Gardens in top shape and shared little pieces of wisdom: "Wales is self-sufficient in things like sheep and leeks" and "When boxwood turns orange it needs fertilzer". Owen uses fish, bone and bloodmeal for fertilizer and tells us he used to spray all the time for blights on apples. Since they ran out of time (less staff on this 220 acre spread) they stopped spraying and they noticed they rarely have blight any more. Go figure. Gwaenynog Hall is maintained by Janie Smith in an attempt to keep the memory of her distant relative Beatrix Potter alive. If you didn't hear the story of Peter rabbit and all his adventures it is time to dig into your child-hood books. These stories were inspired by these gardens.